On behalf of Structured Dynamics, I am pleased to announce our release into the open source community of irON — the instance record and Object Notation — and its family of frameworks and tools . With irON, you can now author and conduct business solely in the formats and tools most familiar and comfortable to you, all the while enabling your data to interact with the semantic Web. irON is an abstract notation and associated vocabulary for specifying RDF triples and schema in non-RDF forms. Its purpose is to allow users and tools in non-RDF formats to stage interoperable datasets using RDF. The notation supports writing RDF and schema in JSON (irJSON), XML (irXML) and comma-delimited (CSV) formats (commON). The surprising thing about irON is that — by following its simple conventions and vocabulary — you will be authoring and creating interoperable RDF datasets without doing much different than your normal practice. This first specification for the irON notation includes guidance for creating instance records (including in bulk), linkages to existing ontologies and schema, and schema definitions. In this newly published irON specificatiion, profiles and examples are also provided for each of the irXML, irJSON and commON serializations. The irON release also includes a number of parsers and converters of the specification into RDF . Data ingested in the irON frameworks can also be exported as RDF and staged as linked data. UPDATE: Fred Giasson announced on his blog today (10/20) the release of the irJSON and commON parsers. The objective of irON is to make it easy for data owners to author, read and publish data. This means the starting format should be a human readable, easily writable means for authoring and conveying instance records (that is, instances and their attributes and assigned values) and the datasets that contain them. Among other things, this means that irON‘s notation does not use RDF “triples“, but rather the native notations of the host serializations. The irON notation and vocabulary is designed to allow the conceptual structure (“schema”) of datasets to be described, to facilitate easy description of the instance records that populate those datasets, and to link different structures for different schema to one another. In these manners, more-or-less complete RDF data structures and instances can be described in alternate formats and be made interoperable. irON provides a simple and naïve information exchange notation expressive enough to describe most any data entity. The notation also provides a framework for extending existing schema. This means that irON and its three serializations can represent many existing, common data formats and standards, while also providing a vehicle for extending them. Another intent of the specification is to be sparse in terms of requirements. For instance, this reserved vocabulary is fairly minimal and optional in most all cases. The irON specification supports skeletal submissions. The aim of irON is to describe instance records. An instance record is simply a means to represent and convey the information (”attributes”) describing a given instance. An instance is the thing at hand, and need not represent an individual; it could, for example, represent the entire holdings or collection of books in a given library. Such instance records are also known as the ABox . The simple design of irON is in keeping with the limited roles and work associated with this ABox role. Attributes provide descriptive characteristics for each instance. Every attribute is matched with a value, which can range from descriptive text strings to lists or numeric values. This design is in keeping with simple attribute-value pairs where, in using the terminology of RDF triples, the subject is the instance itself, the predicate is the attribute, and the object is the value. irON has a vocabulary of about 40 reserved attribute terms, though only two are ever required, with a few others strongly recommended for interoperability and interface rendering purposes. A dataset is an aggregation of instance records used to keep a reference between the instance records and their source (provenance). It is also the container for transmitting those records and providing any metadata descriptions desired. A dataset can be split into multiple dataset slices. Each slice is written to a file serialized in some way. Each slice of a dataset shares the same <id> of the dataset. Instances can also be assigned to types, which provide the set or classificatory structure for how to relate certain kinds of things (instances) to other kinds of things. The organizational relationships of these types and attributes is described in a schema. irON also has conventions and notations for describing the linkage of attributes and types in a given dataset to existing schema. These linkages are often mapped to established ontologies. Each of these irON concepts of records, attributes, types, datasets, schema and linkages share similar notations with keywords signaling to the irON parsers and converters how to interpret incoming files and data. 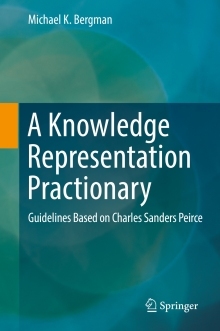 There are also provisions for metadata, name spaces, and local and global references. In these manners, irON and its three serializations can capture virtually the entire scope and power of RDF as a data model, but with simpler and familiar terminology and constructs expected for each serialization. For different reasons and for different audiences, the formats of XML, JSON and CSV (spreadsheets) were chosen as the representative formats across which to formulate the abstract irON notation. XML, or eXtensible Markup Language, has become the leading data exchange format and syntax for modern applications. It is frequently adopted by industry groups for standards and standard exchange formats. There is a rich diversity of tools that support the language, importantly including capable parsers and query languages. There is also a serialization of RDF in XML. As implemented in the irON notation, we call this serialization irXML. CSV, or comma-separated values, is a format that has been in existence for decades. It was made famous by Microsoft as a spreadsheet exchange format, which makes CSV very useful since spreadsheets are the most prevalent data authoring environment in existence. CSV is less expressive and capable as a data format than the other irON serializations, yet still has a attribute-value pair orientation. And, via spreadsheets, datasets can be easily authored and inspected, while also providing a rich functional environment including sorting, formatting, data validation, calculations, macros, etc. As implemented in the irON notation, we call this serialization commON. We have used the unique differences amongst XML, JSON and CSV to guide the embracing abstract notations within irON. Note the round-tripping implications of the framework. One exciting prospect for the design is how, merely by following the simple conventions within irON, each of these three data formats — and RDF !! — can be used more-or-less interchangeably, and can be used to extend existing schema within their domains. The Google discussion group for the irON notation. Mid-week, the parsers and converters for structWSF  will be released and announced on Fred Giasson’s blog. In addition, within the next week we will be publishing a case study of converting the Sweet Tools semantic Web and -related tools dataset to commON. The irON specification and notation by Structured Dynamics LLC is licensed under a Creative Commons Attribution-Share Alike 3.0. irON‘s parsers or converters are available under the Apache License, Version 2.0.
irON is an important piece in the semantic enterprise puzzle that we are building at Structured Dynamics. It reflects our belief that knowledge workers should be able to author and create interoperable datasets without having to learn the arcana of RDF. At the same time we also believe that RDF is the appropriate data model for interoperability. irOn is an expression of our belief that many data formats have appropriate places and uses; there is no need to insist on a single format. We would like to thank Dr. Jim Pitman for his advocacy of the importance of human-readable and easily authored datasets and formats. Via his leadership of the Bibliographic Knowledge Network (BKN) project and our contractual relationship with it , we have learned much regarding the BKN’s own format, BibJSON. Experience with this format has been a catalytic influence in our own work on irON. Please see here for how irON fits within Structured Dynamics’ vision and family of products. Presently parsers and converters are available for the irJSON and commON serializations, and will be released this week. We have tentatively spec’ed the irXML converter, and would welcome working with another party to finalize a converter. Absent an immediate contribution from a third party, contractual work will likely result in our completing the irXML converter within the reasonable future. 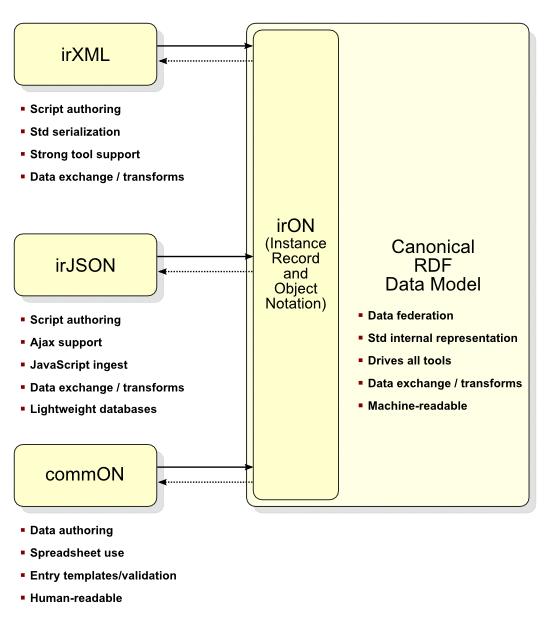 A pivotal premise of irON is the desirability of using the RDF data model as the canonical basis for interoperable data. RDF provides a data model capable of representing any extant data structure and any extant data format. This flexibility makes RDF a perfect data model for federating across disparate data sources. For a detailed discussion of RDF, see Michael K. Bergman, 2009. “Advantages and Myths of RDF,” in AI3 blog, April 8, 2009. See http://www.mkbergman.com/483/advantages-and-myths-of-rdf/. An attribute-value system is a basic knowledge representation framework comprising a table with columns designating “attributes” (also known as properties, predicates, features, parameters, dimensions, characteristics or independent variables) and rows designating “objects” (also known as entities, instances, exemplars, elements or dependent variables). Each table cell therefore designates the value (also known as state) of a particular attribute of a particular object. This is the basic table presentation of a spreadsheet or relational data table. Attribute-values can also be presented as pairs in the form of an associative array, where the first item listed is the attribute, often followed by a separator such as the colon, and then the value. JSON and many simple data struct notations follow this format. This format may also be called attribute-value pairs, key-value pairs, name-value pairs, alists or others. In these cases the “object” is implied, or is introduced as the name of the array. structWSF is a platform-independent Web services framework for accessing and exposing structured RDF data, with generic tools driven by underlying data structures. Its central perspective is that of the dataset. Access and user rights are granted around these datasets, making the framework enterprise-ready and designed for collaboration. Since a structWSF layer may be placed over virtually any existing datastore with Web access — including large instance record stores in existing relational databases — it is also a framework for Web-wide deployments and interoperability. BKN is a project to develop a suite of tools and services to encourage formation of virtual organizations in scientific communities of various types. BKN is a project started in September 2008 with funding by the NSF Cyber-enabled Discovery and Innovation (CDI) Program (Award # 0835851). The major participating organizations are the American Institute of Mathematics (AIM), Harvard University, Stanford University and the University of California, Berkeley.